February's round robin blocks are finished and in the mail to the next participants! 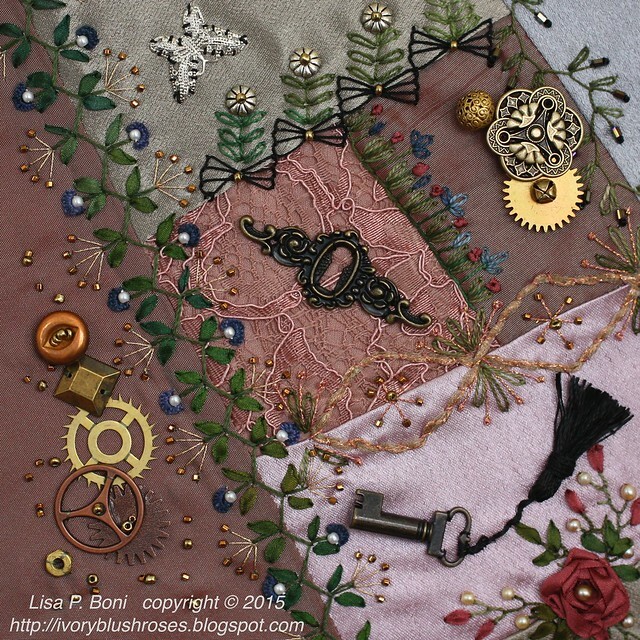 Liz's Steampunk block was lovely and the camera has a difficult time picking up the rich muted colors of dusty rose and mossy/olive greens. 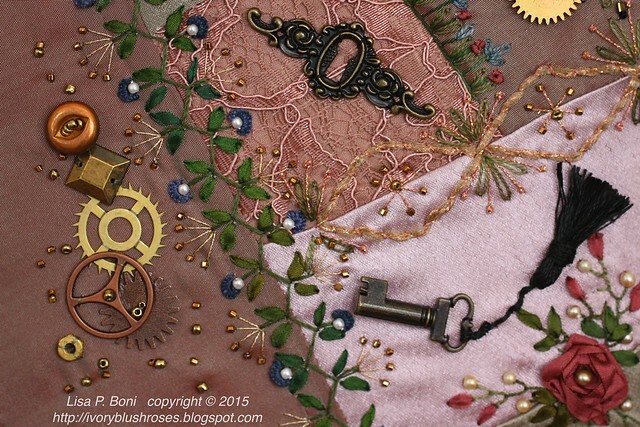 It took me a while to find my way with this block, but once I discovered the escutcheon and key amongst the box of gears and other steampunk bits, it came together quickly. 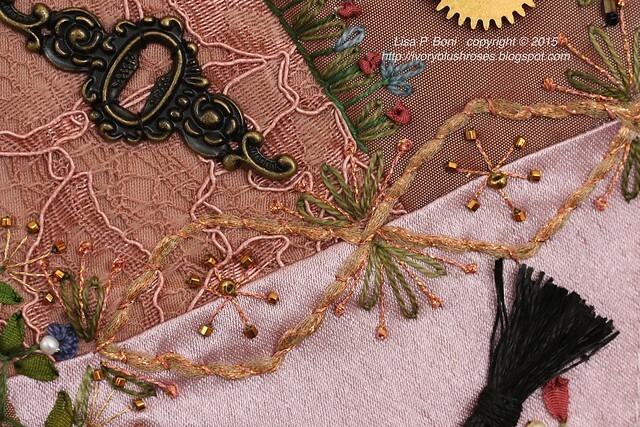 Among my trims was some lovely mossy wire mesh ribbon with a bit of coppery thread through the center. Perfect for a couched seam treatment! I also had a lovely coppery gold fine braid that worked well with it! 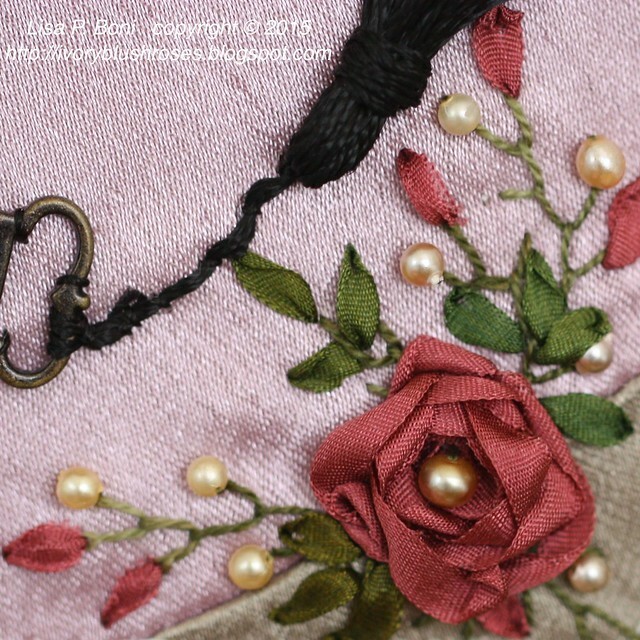 Down in the lower right corner, I stitched a ribbon rose. It came out a bit bigger and a little closer to the corner than I would have liked, but it fills the corner nicely. I accented it with some vintage pearls. The little key was the perfect touch with the escutcheon plate! The little cast on flowers in blue match the blue that Lonna used on her block for Liz. I like being able to pull some colors through from block to block to help them coordinate with one another. Here's a look at the bottom of the block. 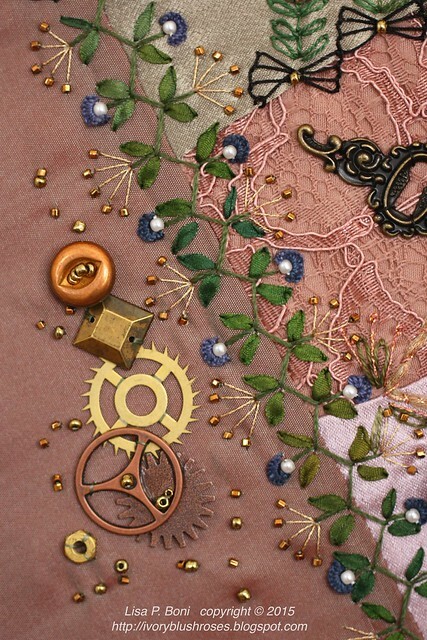 In the lower left corner, I added a nice gear trail with some gold and coppery beads. I'm happy with the way this block turned out and hope that Liz is as well! I also finished my block for Darlene in the Mini DYB round robin. 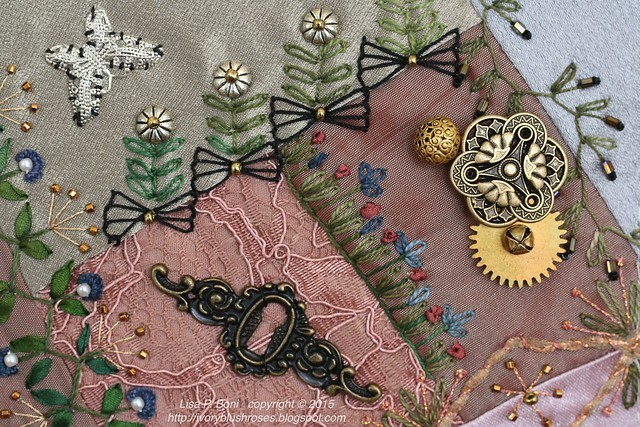 Darlene made several small ornament shapes in fans and stockings. 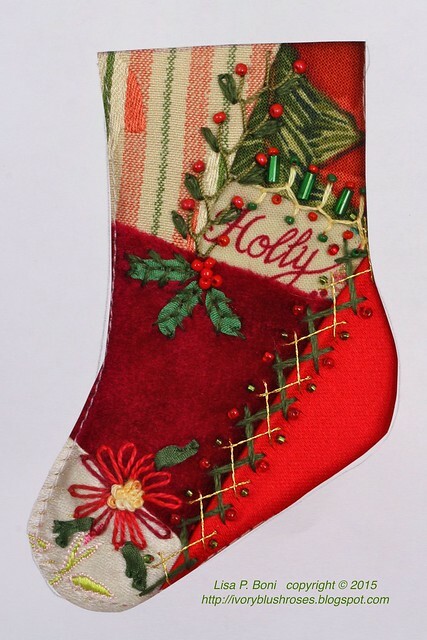 I chose the Holly stocking ~ being rather partial to Holly, since that is my sister's name! This little stocking is only about 3 1/2" high and about 2 inches wide at the widest part! I look forward to seeing how Darlene puts them together! Your work is so beautiful. I keep coming back to look at your color and stitch choices because I need to stitch a small bouquet for my DIL. Thanks for the inspiration. I love that steampunk block too. 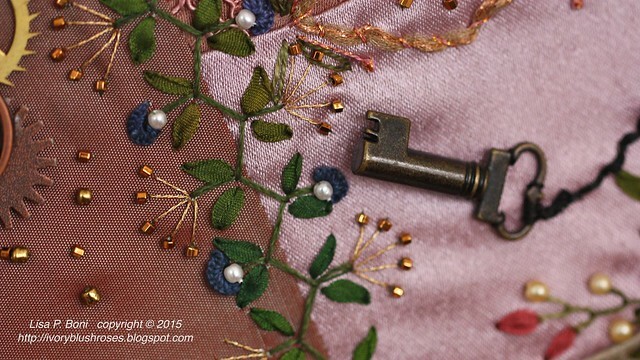 Wonderful colors and exquisite needle work.